222 Veggie Vegan is a vegan restaurant with a consistent evening a la carte menu, while they run a buffet option at lunchtimes. Popular with locals and tourists alike, the food isn’t what I’d call extravagant, but then nor are the prices when viewed in comparison to what you get. For £15 you can easily enjoy a starter and main, with a tangy smoothie to wash it down. This restaurant works extremely well with its allocated space, a small dining area and kitchen, but don’t be surprised with some repeats on the menu as a result. My partner once had a mushroom soup which was gorgeous, but was effectively the same sauce that came with his main (the stroganoff). Luckily, lover of mushrooms that he is, this wasn’t a problem. Anyhow there are greater issues at stake, bigger soyfish to fry, like the fact that their avocado pomodoro starter is to die for and if you don’t try it immediately you will likely die. If for nothing else, this appetiser makes the trip worth it. 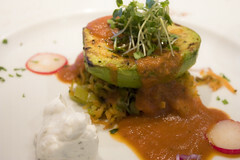 Baked avocado is a real treat, and this creamy lovefest of joy on my plate definitely got my droolers going. Sliced avocado with tomato sauce and vegan cream, straight from the oven. An ideal way to sharpen your taste buds before the main course. Nothing extraordinary, but still highly palatable and definitely delicious, I’ve ordered this twice. It’s cute, fun, and very filling, and I’d definitely recommend anyone try it. Fresh pancakes stuffed with tofu cottage cheese, broccoli, and pimento sauce, re-baked drawing out the fine flavour. Served with sautéed baby potatoes. Remember what I said about the avocado starter? Scratch that because this is where it’s really at. The sauces are like a creamy pudding both in flavour and texture, something I’ve missed for years as a veggie. Go and get it. Now. 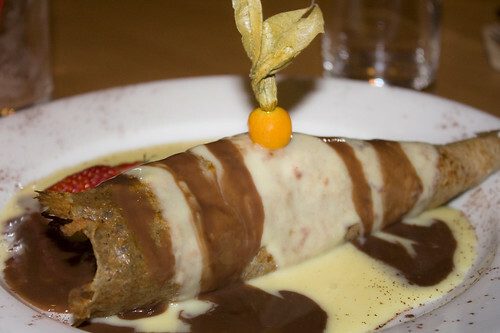 Vanilla ice cream wrapped in a wholemeal pancake, topped with warm vanilla and chocolate sauce. I’d definitely return to 222 and would recommend anyone try it. While it’s not my favourite vegan restaurant, nor the best at which I’ve eaten, it’s a lovely spot with nice staff and good food. Veggie Vegan is my local – a 5 minute walk from my flat and it is totally fab and I love it lots. My only gripe is that they never change the menu. I have been asking them to change the menu for a good 3 or 4 years. They always tell me they are about to change it, but it never happens. So if you are reading this please please please change your menu, I love your food, but I really am wanting to have something different from my much loved local vegan spot. I sort of wish they'd spice the menu up a little, too, and maybe have some more prominently displayed daily specials…. I loved 222 when I went there last year, I had the same starter as you and it was gorgeous. I must go to london again soon and go!! I always mean to go there, but haven't made it yet!